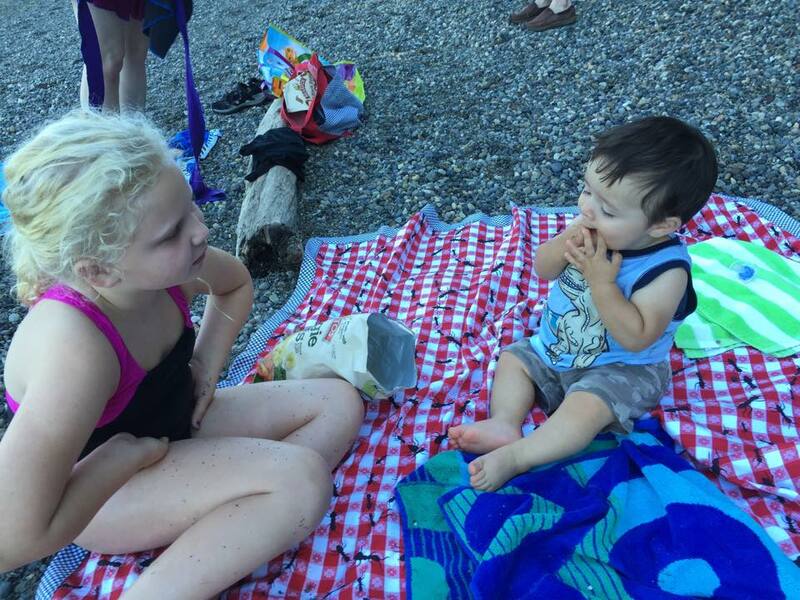 One of the highlights of my summer so far was being visited by some of my closest friends and their kids. They attended storytime, devoured pancakes, sticky-fied my house in the best possible way, read me books, braved the coldest waters and piled rocks on the beach. It was the best. Thanks, friends, for giving me permission to use the awesome pics you took on this trip. If any of you ever get the chance to have personal friends attend storytime, do it. Sometimes as librarians we get used to talking about early literacy to people who are basically strangers, but then forget to share what we do with those closest to us. Now, all my friends have heard me talk about this for years, but it was still super rewarding for me to host them in my element. Then I skipped out of work for the rest of the day and we hit the beach before they went home. And snacked. Duh. 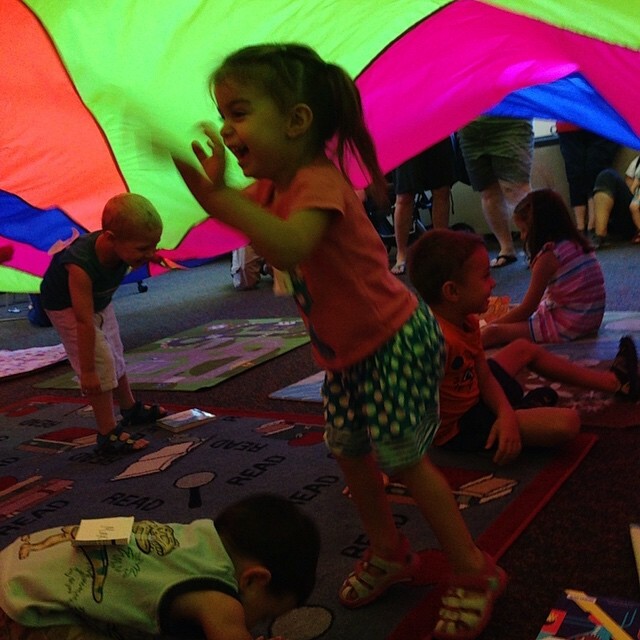 Categories: Storytime | Tags: early literacy, parachute, play baby play, storytime | Permalink. 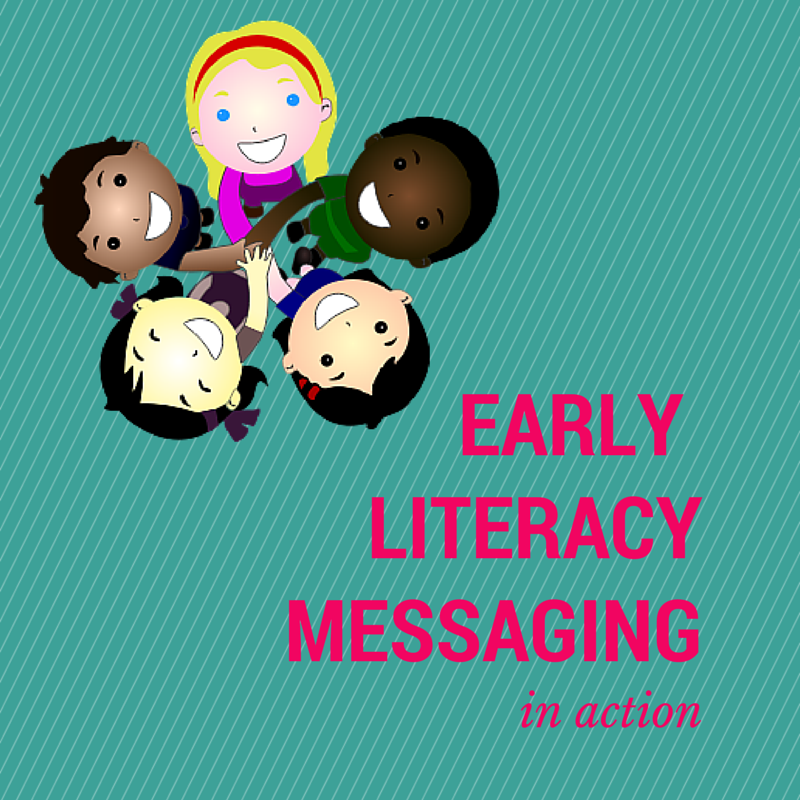 This post is part of a blog tour discussing the use of early literacy messages in storytime and other early literacy programs. Each stop on the tour will include practical information for ways to include messages and why we feel it is important to do so. The tour round up can be found on jbrary.com on Friday, June 19th. I’m going to start with the why. For many of us, and for many caregivers, reading, talking, singing and playing with children is natural. Why wouldn’t we do those things? Not everyone gets it. They understand their child will need to learn how to read and write. Which might include the alphabet and numbers and learning how to sit still. This knowledge might have brought them to your storytime. Where they believe all the learning about reading and writing will happen for their child. We know better. What a child sees and hears in a storytime will not make them readers alone. It will help, sure, but to truly develop all the skills they will need for learning to read and write in school, they will need their caregivers to continue reading, singing, talking, playing, and writing with them outside the library. Some caregivers already know this and their knowledge and actions will be affirmed when we talk about early literacy in storytime. Those who don’t might hear just the thing to spur them into sharing an extra book this week and singing a song at the bus stop next week and talking about all the things they see in the grocery store the week after that. Maybe not. But wouldn’t it be better to share our knowledge? Because it could be just what they needed. I often hear concerns that sharing messages will sound preachy or like a lecture. It really doesn’t have to, and in my opinion, it shouldn’t. If it feels like school you’re doing it wrong. The key to success for me (everyone has their own style hence the blog tour!) is being enthusiastic and conversational. 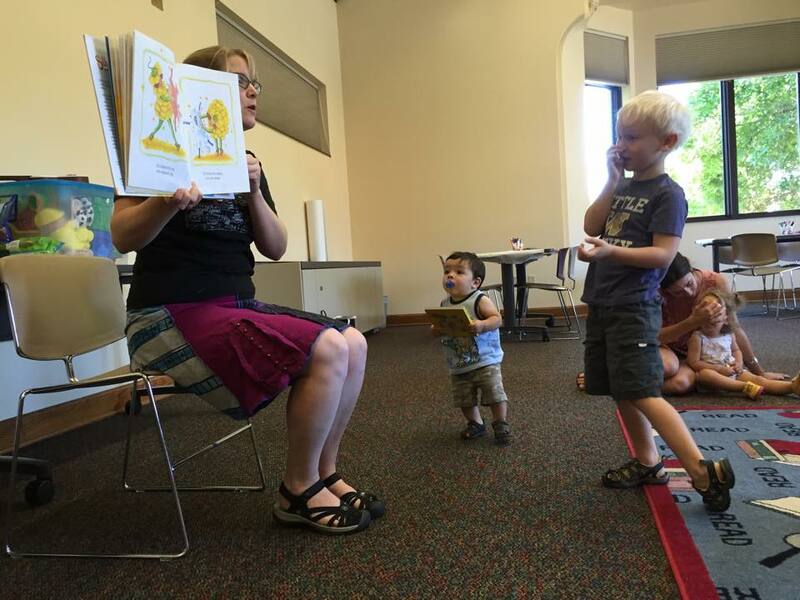 From the moment a patron walks into the storytime room I engage with them. “Hello! How are you today? Please give yourselves nametags (these are for caregivers AND children) and then you can join me on the storytime rug with all these books!” Every participant gets basically the same welcome. Even if I’m in the middle of an enthralling board book on colors, I look up long enough to welcome them to the room. This creates a welcoming, comfortable environment. Newcomers and old timers alike hopefully feel as though they belong the moment they set foot in the room. They like this feeling, and in turn, they like me for making sure they never had a chance to feel awkward (oh my goodness, what do I do, do we get a nametag, do we go sit down, where do we sit, ACK). This gets me lots more head nods and feedback than the old way ever did. Not only do they trust me and like me because I have been nothing but welcoming from the start, but I’m including them in the entire experience rather than being the talking head at the front of the class. They are having fun when I talk to them about early literacy so they are more likely to remember what I’m saying. 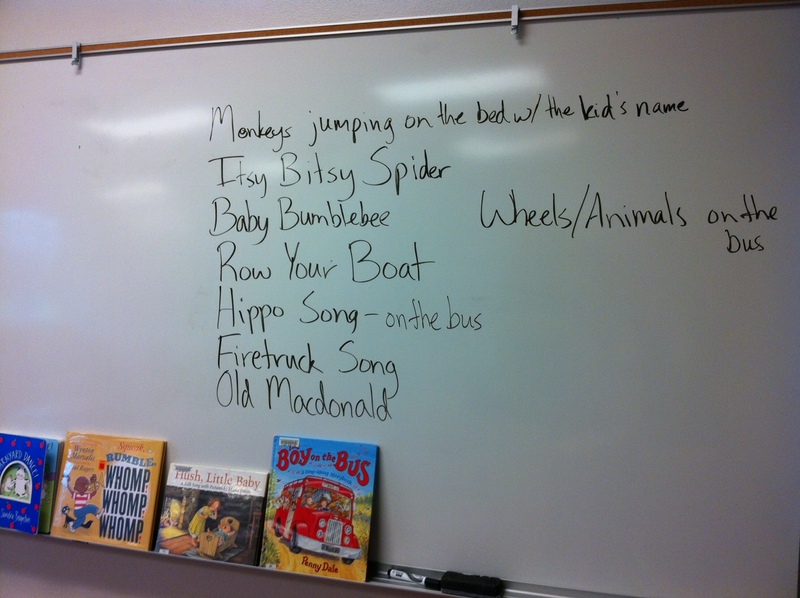 After storytime a few weeks ago a mother asked “Do you have any suggestions for songs that would be good for changing the words to?” So, she heard the message! And we developed a deeper relationship. Moral of the story: know your stuff, be open and welcoming from the beginning, and HAVE FUN! Relationships and trust will develop quickly. Enthusiasm is contagious so be excited to share what you know! Categories: Uncategorized | Tags: #EarlyLitInAction, early literacy, storytime | Permalink. Can’t believe I’m JUST getting to this! I did the presentation the first week in April! The presentation was part of Tapestry, an Early Learning conference for Southwest Washington. According to one of the conference chairs (who also happens to be my boss!) the conference was not as well attended as in the past, and that’s really too bad because there were a lot of GREAT looking programs. I didn’t get to go to any since I was presenting the whole day, but man, the descriptions sounded awesome. Even though I did two presentations, really workshops, there was some overlap. That was OK, though because there were different people in each workshop (except one who was with me all day!). Set up: in each room I set books up for display all around the classroom (used the marker holder on the white boards) for browsing before and after the session. This was a feature participants really seemed to love. The props I brought were on display at the front of the room and available for “petting” after the session. Handouts were on a counter by the door for taking as they came in or left. This one was originally intended to be specific to infants and toddlers, but there was a mistake on the program so it was listed as being for preschoolers and kindergartners, too. 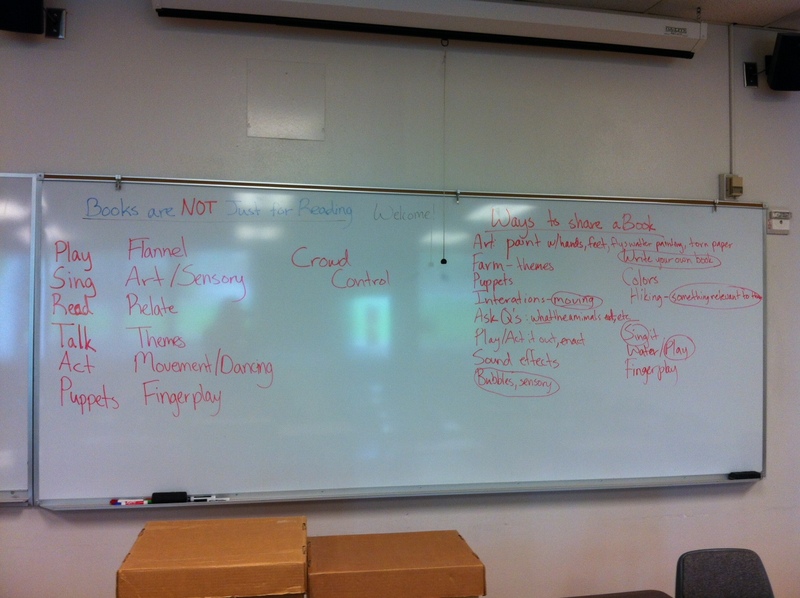 I brought along several books for older kids with a few ideas for ways to use them besides straight reading, so no biggie. Having been to many, many presentations over the years I know the ones I’ve learned the most from included lots of audience participation. So, as people came in I handed them a book and a piece of paper. I tried to match the book to the ages each participant works with, which was a great opportunity to learn more about each participant right away. After introductions they had 3 minutes to look through their book and write down ways they thought they could use it besides straight reading. Then I wrote what they came up with on the white board. We talked about each of the things they came up with and I added or embellished a few as we went along, and clarified and grouped them in to main ideas (on the left). I loved that they thought of things I hadn’t-using a book for crowd control, yes! Now time for demonstrations! I spent about 20 minutes showing them various ways to “extend” a picture book. I even addressed ways they could use a book for crowd control since that was something they suggested. In toddler storytime I use a song book (usually something by Jane Cabrera) right after our prop activity to calm everyone down and get storytime wrapped up. It works every time! Ways to use a picture book: sing it, dance with it, bounce to the rhythm, picture walk, flannels (and cookie sheet magnet boards), instruments, show pictures with music cd playing, puppets, signing, eBooks (Tumblebooks), play with it (flap books and more!) and act it out. Next I put them in groups and asked them to work together with the books they had from the beginning to come up with activities they WOULD use in their classrooms. I wanted them to be able to walk out the door with some practical ideas they knew they would and could use. Taking the planning step out makes it more likely they will use what they learned. They all wrote down TONS of ideas. One was reading Old Black Fly by Jim Aylesworth to Kindergartners armed with flyswatters and asking them to wave the swatters at the book on the Shoo Fly part. Then follow with dancing to a version of Shoo Fly and art with the flyswatters. Sounds like a great time to me! Others included sharing Piggies by Don and Audrey Wood with toddlers and then doing This Little Piggy on their fingers; singing Brown Bear, Brown Bear followed by an art project with paint to talk about the colors they saw in the book; and sharing Dancing Feet by Lindsey Craig (dancing all the while, of course!) followed by art with different mediums like the ones in the book (corrugated cardboard was the one they were most excited about). My goal was for participants to leave with practical ideas to apply to their classroom and to feel comfortable using books in many ways. I felt like the presentation was a total success (and the evaluations said they liked it!). They left smiling and with lots of ideas written down on their notes. 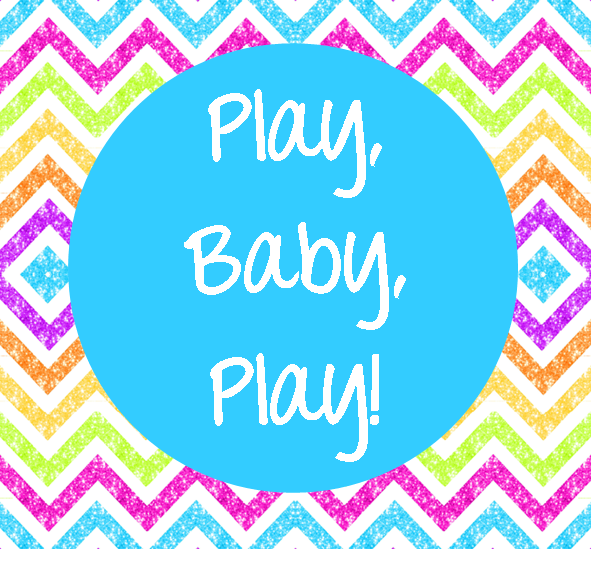 My goal for this session was to put all the stuff I do in baby and toddler storytime and share on this blog, in a presentation. There were a few things I had to tweak from my original outline (there was NO way to get the parachute out in that classroom due to the number of desks, for example) but overall I think it went well. 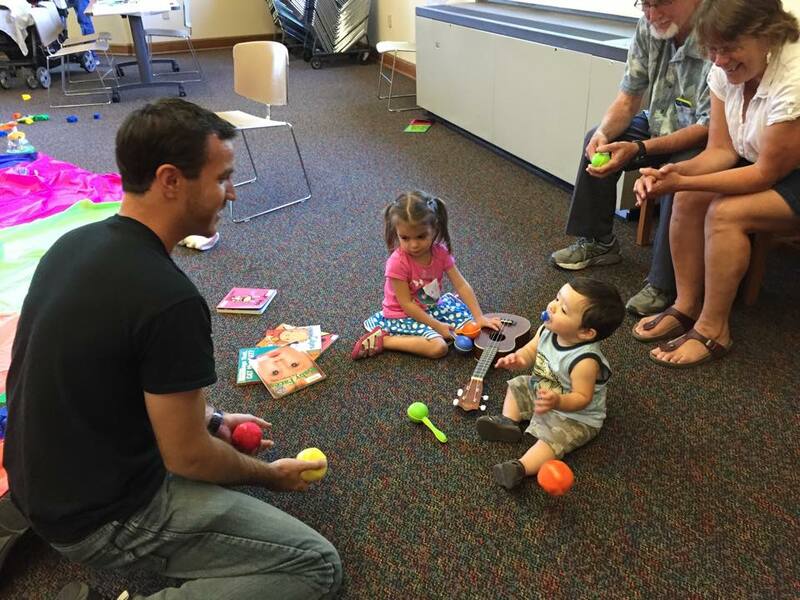 Two hours is long time to sing, rhyme, read, and play with a small group of grown ups. Still, I think we all had fun and we all learned lots of songs and rhymes to use with real, live kiddos! 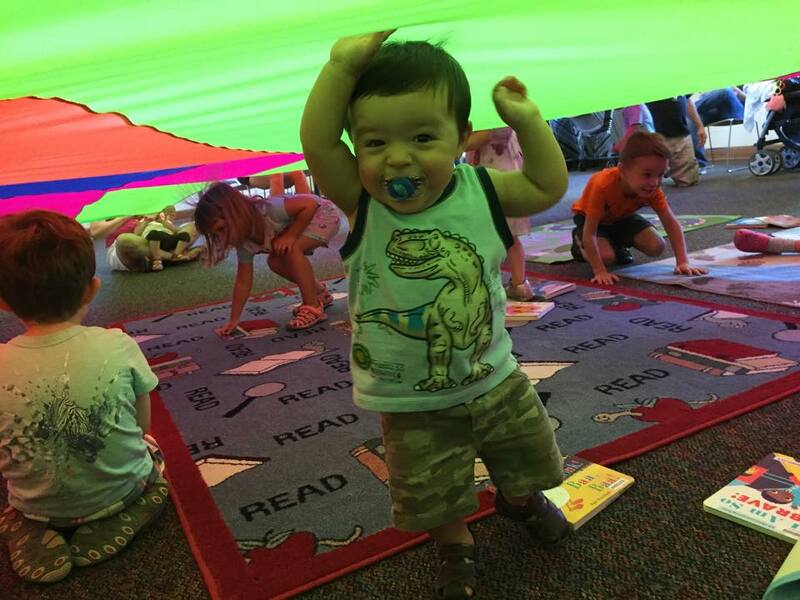 Program description: Music and rhythm activities for infants and toddlers using books, props and our bodies. I started similarly to the first presentation by introducing myself and asking them to do the same. Only this time I asked them to share their current favorite song, rhyme, or music activity in their classroom. A couple of them had the same favorite: Wheels on the Bus, with a twist (animals, etc. on the bus). Before going any further we all had to learn these songs. I, for one, did not know the Firetruck Song! Toddlers + Firetrucks = WIN. 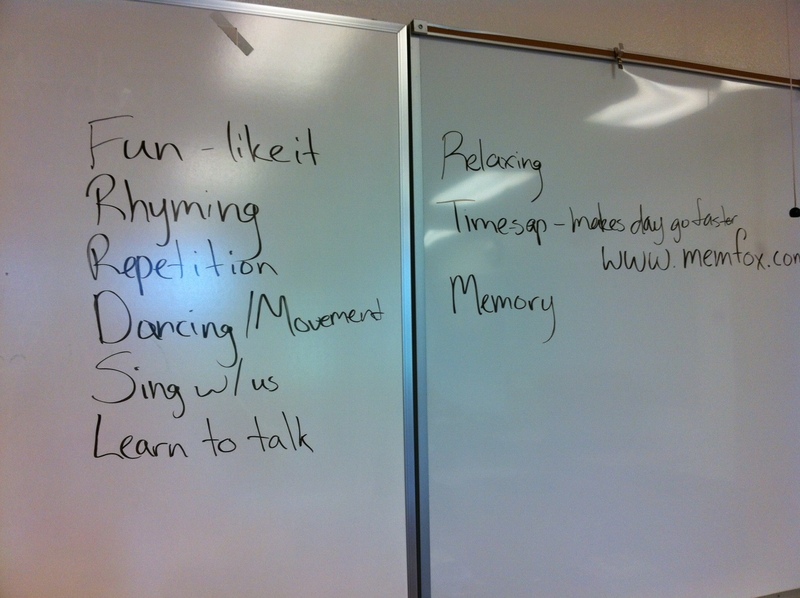 Next I asked them why they thought music and rhyming was important for babies and toddlers (see what they came up with below) and talked to them about the importance of music for the littlest kids (you can see all the stuff I talked about in my outline). I didn’t want to go on about this forever because this was the after lunch session and I got the feeling they were much more interested in learning rhymes, songs and techniques to take away than the philosophical stuff. Plus, based on their responses to why music is important, they already know why to do it. They needed the how, the practical part. I talked a little about how to choose appropriate recorded music: if there are actions to follow they need to be slowly paced, find songs that are relevant to their lives (Firetruck song! ), music you enjoy as well so you’ll be more likely to want to play it. For other songs and rhymes they should be easy to sing, repetitive, and fun! Songs to work on self regulation are great (stop and go, sit and stand, etc.) and simple movement rhymes (wigglers) are great for toddlers and most bounces or tickles are appropriate for babies and toddlers. For learning rhymes and songs, each participant received a shaker, scarf, and paper sun glued to a craft stick (for You Are My Sunshine). For any activity involving the parachute I asked them to use their scarf instead. We spent the last hour rhyming, singing, tapping, playing and dancing. I started by demonstrating a lot of the same things from my first presentation (this was the overlap) like reading Monkey and Me by Emily Gravett to be a bounce and doing a 5 or 3 little anythings to the same tune of 5 Green and Speckled Frogs or 5 Little Monkeys, or to a rhyme (they all left with directions to access Flannel Friday for a plethora of counting rhymes). They were each given a rhyme sheet to take with them so after my demo we learned all the songs and rhymes on that sheet, plus some. We had to do them each 3 times, of course, to learn them better, just like we would with children. At the end of each session I gave them information about how the library can help them, how to get an educator card, etc. and handed out a resources postcard with info about Flannel Friday, web resources and library resources, rhyme sheets, and a booklist (I’m happy to share any of these documents, just let me know!). Then there was time for questions and general after program chatting. It was a lot of fun! Categories: Other Library Stuff | Tags: babies, early literacy, education, music, presentations, toddlers, workshops | Permalink.